The human CD90 antigen (also known as Thy-1) is the smallest (18 kDa) member of the immunoglobulin gene superfamily (IgSF). It is a highly glycosylated molecule with a glycosyl-phosphatidylinositol (GPI) anchor consisting of a single IgSF variable domain. The CD90 molecule has a broad tissue distribution and is expressed in nervous tissue, connective tissue and various stromal cell lines. It characterizes a rare subset of human fetal bone marrow cells, that contains multipotent hematopoietic progenitor activity. 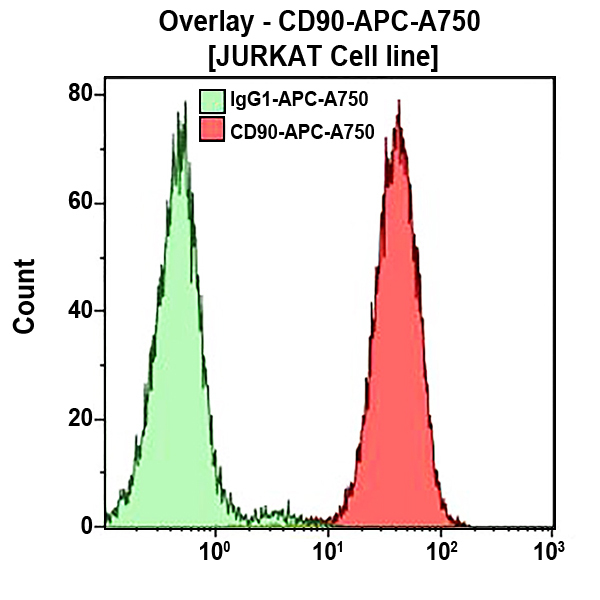 This antigen is expressed on a subset of CD34 positive cells from human bone marrow, cord blood or fetal liver. It is also expressed on very small subsets of thymocytes and peripheral T-lymphocytes. *Alexa Fluor and Pacific Blue are registered trademarks of Molecular Probes, Inc.